Ladies and Gentleman. 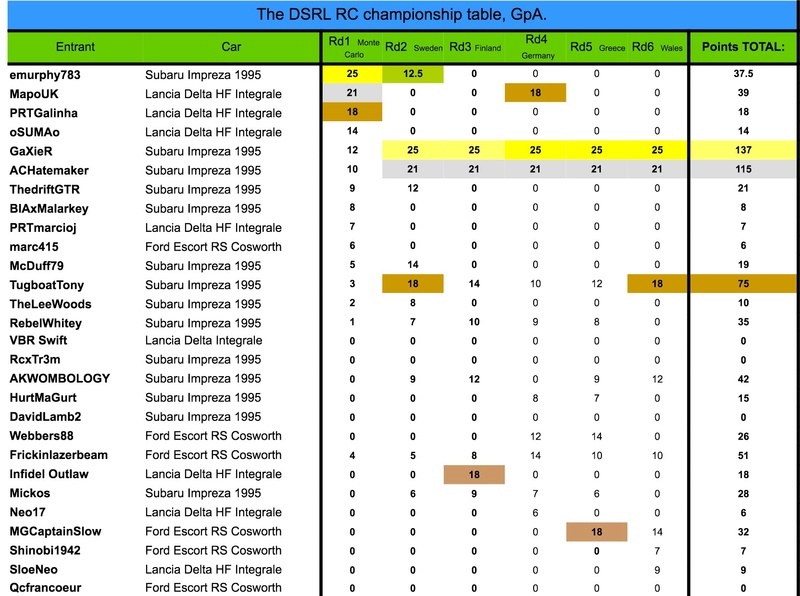 Above are your final standings for the first ever DSRL Rally Championship. Congratulations to RC Gaxier and Epileptic Toast on their respective Class Championship Titles. Also Congratulations to Team RCT for sticking with it and Taking the Teams Championship! This has been a tougher than tough championship that saw many fall by the wayside. Thank you and congrats to all who stuck with it and brought home the bacon! The 2nd DSRL Rally Championship is open now for SignUps. With a short calender and simplified format hopefully that will provide some light relief to those who have toughed out season 1! Wahoo! 4th in class! Far better than I'd expected many thanks to McDuff & EpilepticToast for the running & organisation of this series, other than a couple of 'off' rounds on my part, thoroughly enjoyed the format & way this series ran. @Fricknlazerbeam wrote: Wahoo! 4th in class! Far better than I'd expected many thanks to McDuff & EpilepticToast for the running & organisation of this series, other than a couple of 'off' rounds on my part, thoroughly enjoyed the format & way this series ran. Ah well done mate! Great to know you've come out happy! Best of luck for Season 2.... Give it some duder! 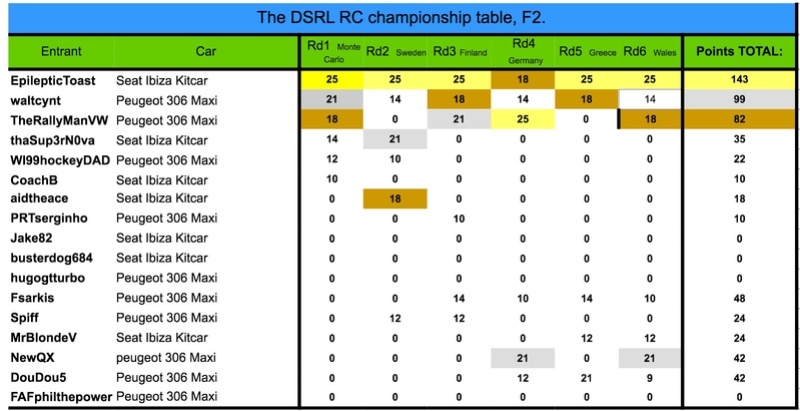 Congratulations to RC Gaxier and team RCT for their respective championship wins! Very happy to bring home the F2 kitcar championship in the Seat Ibiza, it was a great consistent little car in most locations!